Climbing on the internet#2 - one to make you jealous! 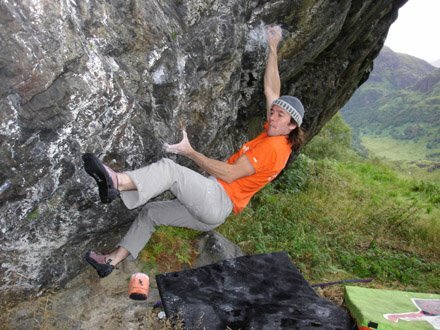 Here is another good climbing blog by Iain and Gill charting their world tour of climbing after taking a career break. You guys will make a lot of people either jealous with that blog... or leave their jobs! Nice pictures, lets have more of the same. I scrolled down both inspired and depressed as the rain batters off my window right now. But at least I've done the last route on the bottom of the page! Above is another picture of Iain on it. It's been a week of being quite overwhelmed by the response so far to Hotaches film E11. 13,ooo downloads of the trailer in a week or so!! I cant really get my head round that number. Anyway thanks to everyone who has ordered it so far from my webshop, and to the folks who have reviewed it so far. This is what Joe Simpson had to say! 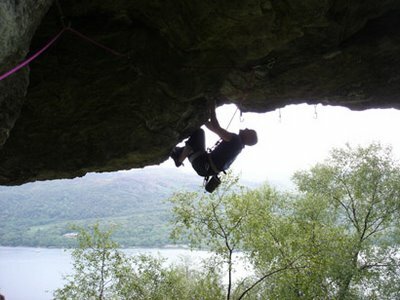 "Sixty five foot falls, wires exploding, screams of agony, howls of frustration, blood in the shower, and the ecstasy of triumph - this is what it takes to lead 'Rhapsody' on Dumbarton Rock, probably the hardest traditionally protected rock route in the world. 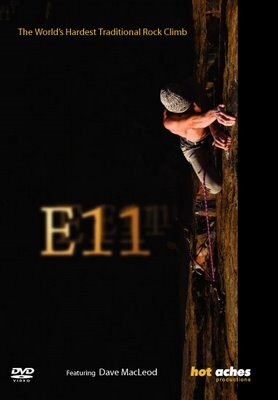 E11, the video of Dave Macleod's eventual ascent of this groundbreaking climb is an alarming insight into the utterly obsessive psyche of world class climbers. They appear quite demented. Yet, Dave Macleod, like Cubby Cuthbertson who made the groundbreaking ascent of Requiem on Dunbarton Rock in the early eighties is self deprecating, modest and possessed of a fierce determination to make the impossible possible. Compulsive viewing. I particularly liked the screams - didn't know whether to wince or laugh!!" Its a bit strange to hear someone famous talking about my route. 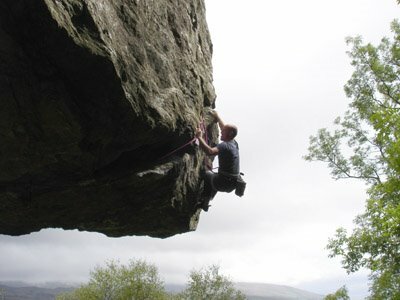 Niall McNair grunting on Spitfire 8a which was seeing queues the other day! Some serious progress has been made on my Anvil roof project It's perma dry and its just as well as the Scottish autumn deluge is in full swing. This project has been causing my muscles serious aches and pains. It's really the perfect angle for a workout - 45 degrees and 8c so most of the holds are first joint but still positive. Except for the pinky pocket that is. I needed some serious sleep to recover from my efforts, but I had to get up early and go to a job interview - I know! - me? job? working for myself has meant 19 hour days at times during summer so I thought some regular work might help things out and allow more time to climb. I'm such a rubbish blagger though, so left the interview feeling depressed. 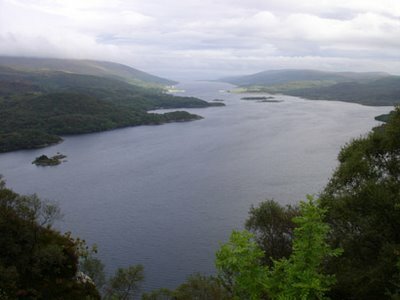 Some more stuff on the Anvil and our Argyll adventures in general on Michael's blog. It was a great pleasure to hold Michael Tweedley's rope when he completed his long term project in the Tighnabruaich roof. 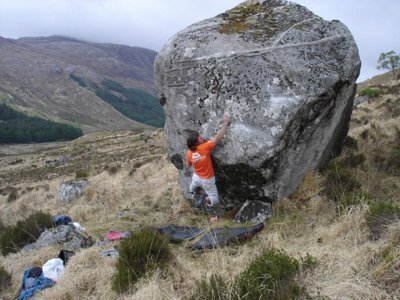 The line was pretty well known even before Mike had completed it, even starring in a film about Scottish sport climbing. The roof is totally horizontal the whole way and the crux has an amazing kneebar move, hanging upside down from this and crap slopers for hands. 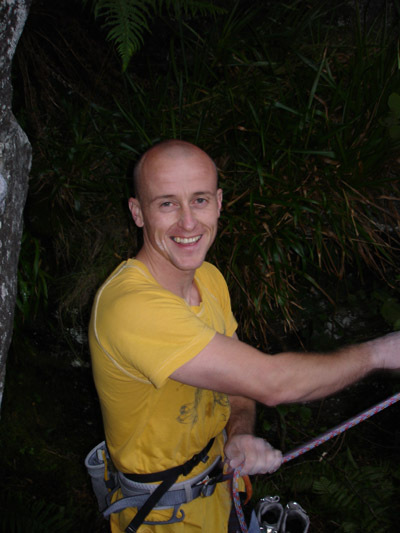 Mike had been out to this move even back in 2004 but kept sliding out of the kneebar despite trying everything from tape to strapping his knee up with marigolds! In the end I developed a new kneepad technology that did the trick; a car footmat and some knee supports under stretch jeans. This comibined with extra training and weekends in the west, and the deed was done. The bad forecast necessitated an alpine start, which left just enough time to fit in Mike's send, and my quick second ascent just as the rain started to fall on the finishing holds at 9am. So with both our projects here in the bag we headed for pastures new - yes, yet another mega steep chunk of Mica shist hidden in Cowal's glens. 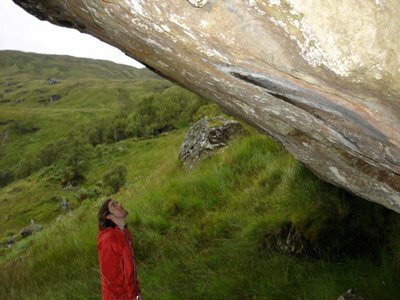 This time a collection of boulders up to 20m high in the lovely wee glen behind Carrick Castle. There are already some completed lines here and many more will be done over the next year I'm sure by myself, Mike, Dave and anyone else who's keen. But the main event for me is really the super futuristic bouldering roof. You can see in the picture above the angle is less than friendly and the holds are no different. 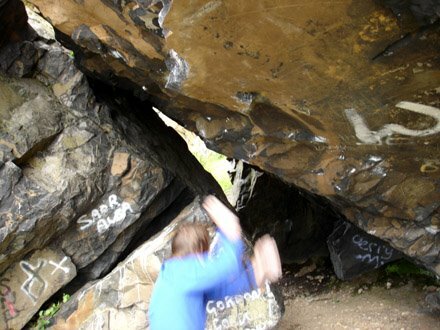 This is a crag that will make just about anyone feel weak and in need of stepping up their training. Planetfear have just put up the trailer for the E11 film. You can see it here. You can order copies of the DVD now from my site (which will be sent out after the film gets its first showing at EMFF on Oct 21st). There's also some more info about the film on Hotaches new website. I hope you like the trailer, its a bit strange hearing my own screams of pain again! Dave Redpath - Gagging for a Hob Nob or just enjoying using his bolt drill? Well I can't say I felt amazingly strong on the Anvil left-hand roof after 4 months away. In fact I managed exactly the same links as last time. However, the scotch mist was thick in the air and it wasn't just me who was complaining about the grease. 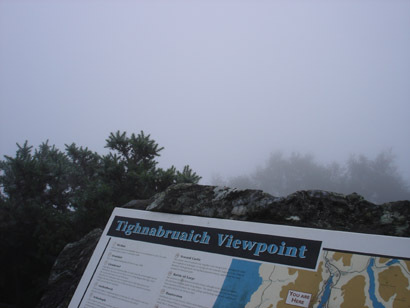 I love this place - new projects, that I bolted myself, mega hard, steep climbing on 'real' holds so you get really worked, relatively unaffected by the west coast rain assaults and excellent moves. It's so nice to have new rock thats so convenient to get to and hard enough that I know it would take a looong time to get through all the projects. I've added another gallery page to davemacleod.com with shots of Holdfast E9 7a, Fugue E9 6c, Achemine E9 7a and The Cathedral X, 11. You can see it here. Many thanks to Cubby Images for these! 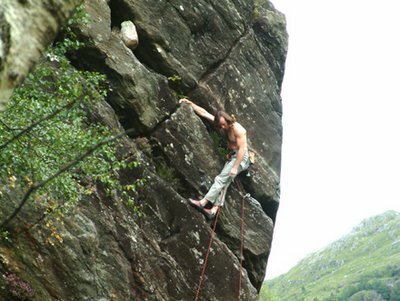 The picture above is of Holdfast in Glen Nevis which is one of my favourite routes - exactly what an E9 should look like really - an immaculate blank wall with no obvious holds or gear. I was inspired! It's also the most serious route I've ever done, with a bone breaking boulder right below the line and no protection until the E1 climbing at the end. I was glad to hear that the route was seeing attention from others recently. It saw an ascent last week from Dave Birkett, using siderunners in the routes on either side. 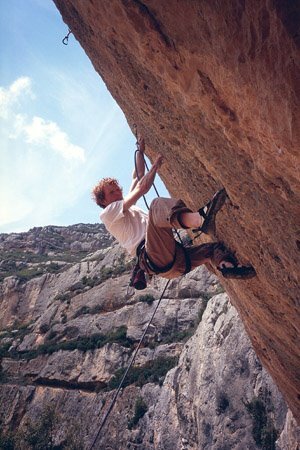 Climbing is perceived to be a highly dangerous sport and its professional athletes are often considered to be addicted to danger. This is a nice idea, but the truth is really that most climbers just enjoy controlling danger. Climbing itself is not dangerous (excepting certain objective dangers such as rockfall & avalanche), only falling off is dangerous. The best climbers are the ones who have developed the highest awareness of their own limits and the potential dangers around them and so can climb safely at the extreme limit of their abilities, hopefully never allowing themselves to step outside those limits. Of course, the limits can be extended by training to climb better, improve fitness and better understand the environments to be tackled. To climb at the highest level today, climbers need to work hard like other athletes on their technical and physical skills, but also develop this awareness of how to be safe in highly pressured situations. The main ingredients for this are a great respect and humility towards mountain (or any dangerous) environments, for life, and a willingness to accept that a long apprenticeship in climbing cannot be shortcut. Commitment is an idea that is really important for all professional climbers. 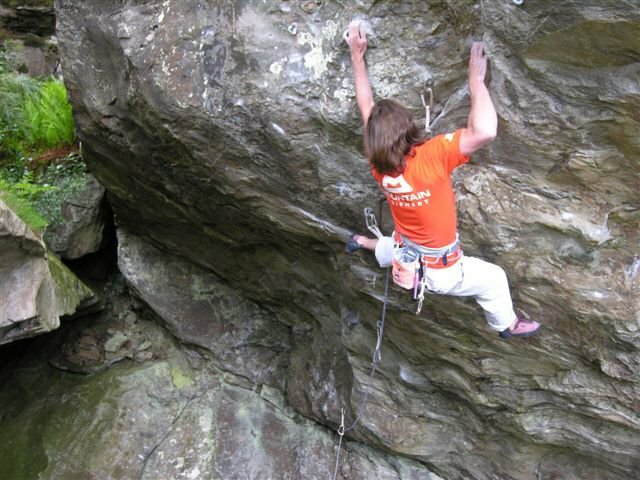 Climbing is a broad church of different activities, so it means different things to different climbers. For mountaineers, it might mean starting up a huge 1000 metre north face with 8 days food and no chance of safe retreat, the only option being to reach the top somehow before food and energy runs out. 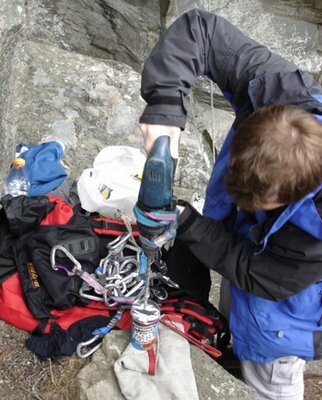 For rock climbers, it might mean launching up a blank section of rock, getting further and further away from the last piece of gear (and hence facing progressively longer fall potential). Hesitation or mis-reading the move sequence will mean dipping into the reserve of physical stamina to get through, or even falling off. Commitment will mean getting safely to the top. For sport climbers, where danger is not an issue, commitment will be to the single-minded athletic dedication to making impossible climbs possible, by hard, uninterrupted training. Mountains, rock faces, islands, sea cliffs, caves etc are all naturally adventurous places because there is much hidden unless you literally climb into them to see whats there. Exploring these places and going where other people haven't been or cannot easily reach is an obvious draw. Climbing is a basic natural body activity we are good at, like walking, swimming and running. 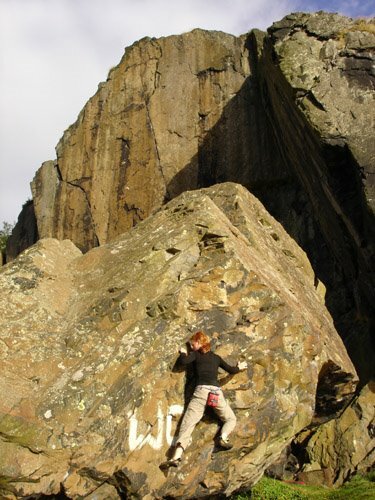 Whereas the other activities involve uniform repetitive movement, climbing involves an infinite range of subtle movements, demanded by the shapes of the rock. This provides its addictive interest and quality. The rock provides its own movement demands, which are often exacting, but leaving enough room for creative movement too, like dancing. For most climbers, the activity is more like a way of life than a sport. I think this is because it has so many strands of enjoyment, so it feels like five or six separate sports in one. 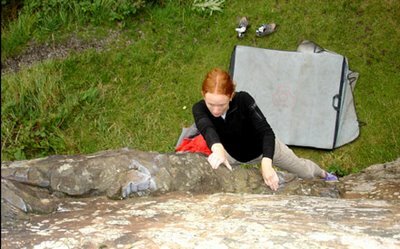 I think climbing partnerships often teaches climbers a lot about relationships with other people, especially relating to trust and how people are very different in different situations. The pressured situations of climbing quickly give insights into the characters of climbing partners. I think this is why is tends to foster strong partnerships and friendships between climbers, and often teaches climbers humility. 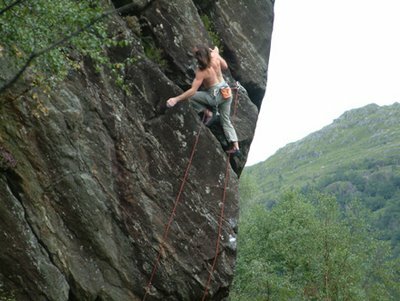 Climbing situations are also a place where status means little, so it often a leveller of class and brings very different people together. 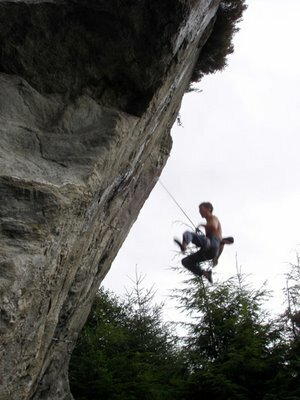 My favourite climbing gear experience - rockshoes only, and the rock of course. I found a name folk have been using for what I've experienced in a lot of modern design and practice in various fields. 'Feature fatigue ' - This link has the definition. I am always wishing for climbing gear that has fewer features that weigh it down, but it does seem that markets are driven, at least partly, by having more features on products, not less. It doesn't just apply to jackets and rucksacks either, I've found myself trying desperately to stay afloat in an ocean of information on improving at climbing. When I coach climbing, I often find that climbers have an appetite for the detail. That is good of course, but not if it is at the expense of getting the basics right. For instance, comparing the fine detail of exercises that improve body tension to keep your feet on, is not a high leverage activity if you haven't learned to use your feet while they are on the wall. I've just been for two days climbing in the prehistoric forest under the viewpoint. Its a wild place, full on jungle warfare to get between buttresses. If a Pterodactyl flew past you probably wouldn't look twice. So many spots in Scotland are like this - as soon as you leave the road behind you are in a wild place (dinosaurs are not common though). 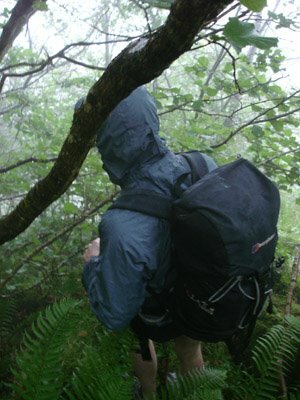 Well, one doesn't want to get ones climbing trooz wet in the ferns, does one. The view as it should be. 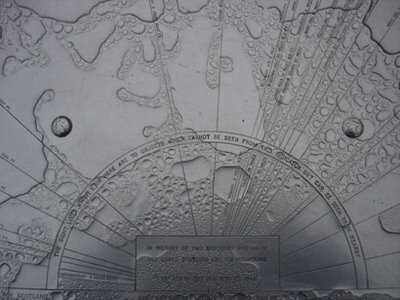 Cowal on the left, Bute on the right. It was good to see Michael looking strong on his uber project. I bolted the horizontal groove and got it done on the second day - 8a+. Featuring some foot off, some bat hanging, some 'feet by hands' undercutting and some spinning around kneebars - exquisite. After so little climbing recently I raced up it like, I don't know... a keen thing... I'm really psyched for the horizontal schist again. The Anvil is in danger next. My other feat for the day was driving to the crag for the first time ever. After a few driving lessons I thought I should try out a longer drive - 4 hours. Woohoo it was fun! Just beyond the crux of Misadventure E8 6c. Stop staring at that arete Dave and get bear hugging! Misadventure is an excellent arete climb - 7c+ish climbing and bold but not death. Relaxing on the finishing section. 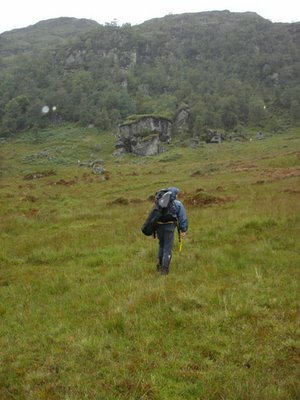 Note the random erratic boulder that decided to hide from the Glen Nevis glacier in a wide crack to my left. 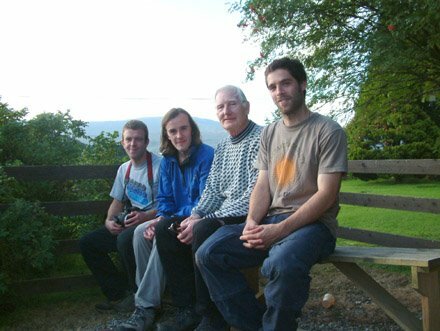 Glen Nevis guys: John, myself, Jimmy (who did the FA of Pinnacle ridge in 1948) and Joe. Thanks to Rona Mackintosh for these photos of my re-ascent of Misadventure in the glen for the Heather Hat film. The route really is pretty good I think. Hopefully some pictures will encourage others to go and repeat it. 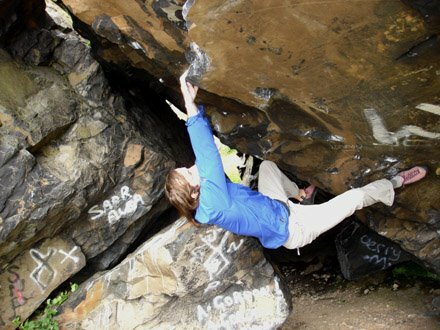 The hard section is exquisite - crimps, into bear hugging smooth slopers, into fist jams! 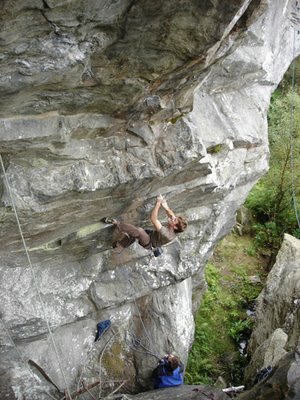 Some good weather is here again but things are not really right for me to go climbing for various reasons. I am constantly in conflict with myself about when to climb and when not to. I don't feel like I climb very much at all, even though people I meet see me as climbing a lot. I also see myself as pretty lazy a lot of the time, although even I would admit that isn't really true. I only worry to myself that I'm lazy when I decide it's not the right time to climb. I'm more aware than ever that my motivation has to feel right to climb. Sometimes (like now!) I feel so motivated to climb I feel like I could rip holds off my projects. I mean, I feel it pretty damn strongly! But at the same time I feel it's not the right time to go back to Ben Nevis yet. There are other things on my mind. Sometimes I feel my climbing motivation is like a resevoir. I can store up huge amounts of motivation until the time is right to release it. Maybe I'll release it training every day, maybe I'll release it all in one go like on the crux of Rhapsody - 2 years of savings in a few seconds or effort. Its a good feeling. Right now, if I could write my climbing motivation like a bank balance, the number of zeros would require additional pages. But I don't need to go climbing right now. I'll make a withdrawal when it's time. I've added a shop page to davemacleod.com. It's got links to my favourite climbing books through Amazon and lists of other books such as training for climbing. You can also buy some climbing DVDs directly from my site. Chains is available now. 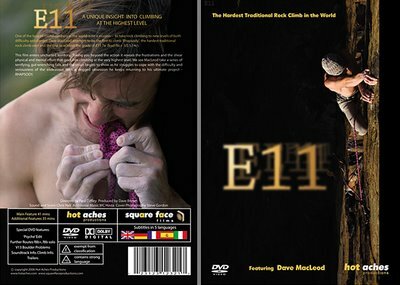 I can also take pre-orders for the E11 DVD by Hot Aches Productions about the first ascent of Rhapsody. The film is showing for the first time at the Edinburgh Mountain Film Festival on October 21st, and DVDs will be sent out immediately after that. All the details are here. It was quite an experience being filmed right through the whole process of working on Rhapsody for nearly a year and a half. I was just really psyched by Diff, Dave and everyone else who helped out. They were always so positive and up for shivering all day long, week after week at the top of the crag, only for me to announce that I didn't feel good that day! When I broke off the crux undercut in October I thought the project was impossible for a while, so I felt really bad that I'd hled their focus for such a long time, but would probably have to give up. Thankfully it didn't pan out like that. Also when I bagged the route in April, it was over for me, but the real work was only just beginning for the guys. I'm looking forward to seeing the results of their impressively dedicated efforts. I've updated my main site with more details about the different levels of coaching I offer and what's included in them on my coaching page. I've also added venue details for my lecture at Leeds University on October 24th on the lectures page. More stuff coming soon. Get in touch if you think any of the pages need more information added or requests for stuff you'd like to see on the site. While the rain came down in sheets on Sunday we went to Sky Pilot and I completed the sit start to Catch 22 i'd tried before. It went at about Font 7c+. The guys got the FA on film. 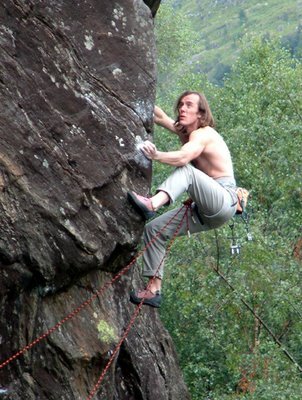 You can see a sequence of the moves on this with some analysis of the techniques over on the Online Climbing Coach blog. The sun comes out at Sky Pilot, just as we have run out of muscle power. 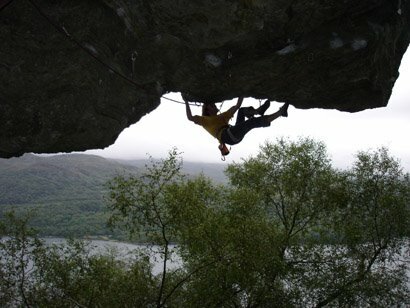 Glen Nevis, one of my favourite places in the world an a fine subject for a climbing film. 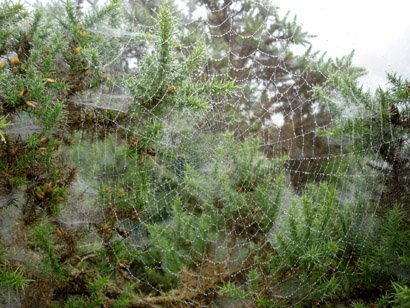 It was a productive weekend considering the onset of Autumn and Lochaber horizontal rain. I was invited to repeat one of my new routes in Glen Nevis for a film about the climbing there. Joe French from Heather Hat productions and friends are making the film for the Fort William Mountain Film Festival next Feb. 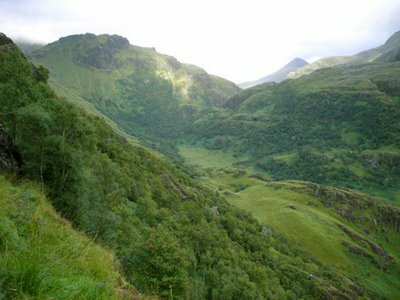 The concept is to showcase the glen's unique atmosphere and appeal by inviting first ascentionists from various eras to return and repeat their own routes. I had the pleasure of meeting Jimmy Ness who reclimbed his route Pinnacle Ridge (severe) at theage of 77, 60 years after he first did it. The film will feature Jimmy's return to Pinnacle Ridge and several other important contributions in 20 year intervals. It will have Terry Sullivan repeating his route Storm (HVS, 1959), Ed Grindley repeating Edgehog (E3, 1982) and finally myself repeating my route Misadventure (E8, 2004). 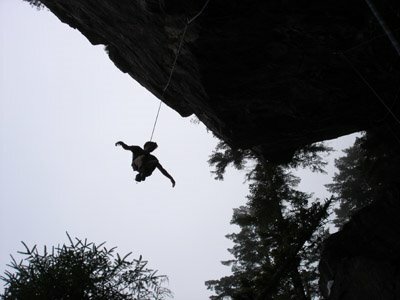 It was the first time I've re-lead a really hard route for a film and it was a scary experience. After watching the footage of Jimmy repeating Pinnacle (in vibrams rather than the Tricounis he used for the first ascent), he seemed to take it rather more in his stride than I did. If I can still climb E8 at 77 I'll be a happy man thats for sure. I managed not to fall off thankfully and survived to go bouldering under the natural shelter of Sky Pilot on Sunday. I managed the SS to Catch 22 at Font 7c+. I'd failed on it on a previous visit so it was cool to feel stronger on it this time. 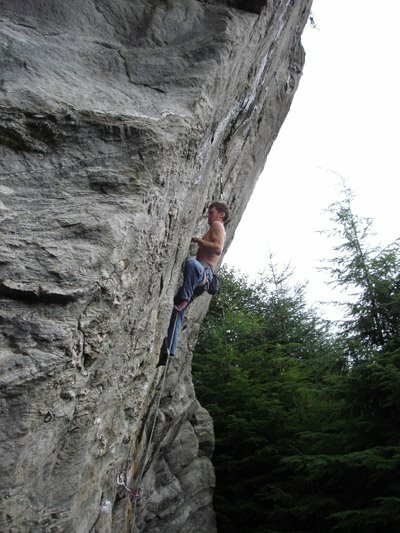 The autumn cool is getting me really fired up for whatever climbing I can do in the coming weeks. 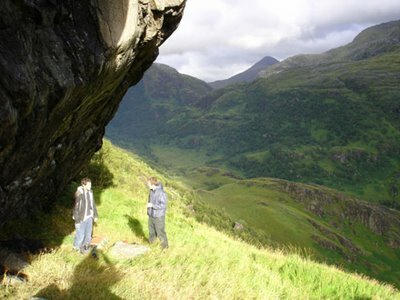 Heather Hat dont have their website live yet but I'll keep you posted about the Glen Nevis film on here. Project - V hard - I did another move!! Alicia getting some practice in on the Basalt in preparation for her soon to be local basalt crags in Minnesota. Autumn definitely seems to arrived with the first day of September. I managed to do another move on a savagely hard boulder project in the back yard. AGGGHHH I feel so unprepared for autumn - so many hard projects I need to be strong for now the cold winds are blowing, but it feels like so little training has been done. It's been a very busy summer. Not very productive from a climbing point of view, but productive in other ways. Setting up the Online Climbing Coach blog has been a lot of work but had a great response so I'm happy with it. Hopefully I can make time to keep it going if things work out with my coaching service.